Book Review: What Are the Jordan Codices? Fresh on the heels of an announcement from the UK about a new Centre for the Study of the Jordanian Lead Books, the Elkingtons have published a third book defending the legitimacy of the Jordan codices, this one entitled What Are the Jordan Codices? The Mystery of the Sealed Lead Books. The articles contained in the book, with one exception, actually constitute a virtually untouched reprinting of the articles from the Elkingtons’ previous publication, The Case for the Jordan Lead Codices. Among some of the editorial changes is the inclusion of my own name where Jennifer Elkington had previously referred obliquely to me as “one particular student.” The anonymous author from the previous book has also now included his name under the title of his paper. The largest change, however, is the addition of an article written by Dr. Samuel Zinner that draws from a larger paper he has recently published on academia.edu that argues the Jordan codices are indeed modern, but are not forgeries. Rather, they are carefully crafted early modern Zionist “lag baomer” amulets. Zinner’s analysis is creative and thorough, although I believe he skirts around many of the issues that complicate the question of the codices’ origins and the involvement of the Elkingtons. See the full paper for the details of his argument (which are much too detailed to address here). What Are the Jordan Codices? is, as with the previous volumes, an attempt to arrogate academic legitimacy to the thoroughly unacademic machinations of David Elkington and some compatriots. The articles penned by the Elkingtons and their psychologist colleague uses absolutely horrific personal attacks on me and several other scholars as a smokescreen to obscure and evade their own manipulations and dishonesty, all while accusing us of ad hominem. I am happy to see that perhaps the codices will hopefully see the light of day so that they can be more directly and thoroughly studied. I still think, however, that the vast preponderance of evidence securely supports the conclusion that the codices are modern productions intended for sale and profit. I am more than happy to be proven entirely wrong, though. Despite the claims of the Elkingtons, I have never attempted to suppress the study or availability of the codices. In fact, as I have pointed out before, I have publicized more photos of the codices and analysis of their iconography and text than Elkington ever has. I would publicize any and all photos and reports and studies that he makes available. Unfortunately, and as anticipated, he saves those details for paying customers. Jim Davila notes on his blog that The Economist is reporting the formation in London of a Centre for the Study of the Jordanian Lead Books. The Centre’s board will consist of some British politicians, and an “evaluation panel” will be headed by Richard Hayward of Durham University (a phenomenal scholar of early Judaism) and Fayez Khasawneh of Yarmouk University. This is an interesting development, and I note The Economist’s anonymous article is still taking swipes at “intemperate things” said on the blogosphere. Stay tuned! What is scary is that these ‘Bibliobloggers’ are now a recognized entity within one of the most powerful organizations in academe – the Society of Biblical Literature. Two thousand years (and more) of patriarchal oppression and control are starting to crack under the momentous, unstoppable truth movement currently gaining rapid pace on this planet. The deceit, lies and veils of disinformation are starting to fall and reveal real truth and wisdom which they have tried, with the most destructive and deceptive forces possible, be it bombs or blogs, to suppress. “. . . truth and wisdom which they have tried, with the most destructive and deceptive forces possible, be it bombs or blogs, to suppress.” Well, that’s an unfair analogy if I’ve ever heard one. Sunday night Margaret Barker appeared on the radio show Coast to Coast AM to speak with Ian Punnett about the Jordan Codices. The interview can be found here, beginning around 21:45 and running to 38:45. Barker has been publicly associated with the codices since Elkington’s initial press release at the end of March in 2011, and during the interview she explains that she first saw photos of the codices about four years ago, meaning she was involved for a couple years prior to the original press release. The blurb on the interview states, “This is the first time any scholar from the academic establishment has spoken out on the Jordan Codices,” which is flatly false. Aside from well-respected university professors from the US and the UK who have commented directly and repeatedly on these codices, I and several other students participate regularly in the “academic establishment.” The mere act of blogging no more invalidates one’s academic credentials than does the act of appearing on a radio show, the fervent assertions of some non-academics notwithstanding. Barker’s message, broadly speaking, is that metallurgical studies indicate the metal is ancient, and so at least a portion of the hoard is likely to be ancient. This is nothing new, of course. This has been Elkington’s rallying cry since criticisms were first leveled at the antiquity of his codices, and it has been repeatedly pointed out that ancient lead does not necessarily mean ancient codices. Unfortunately, neither Elkington nor anyone acting as his mouthpiece has bothered to acknowledge—much less address—that fact. Instead, attention is diverted away through a number of tactics to which Barker herself appeals in this interview. I’d like to address a couple of them. First, Barker has trained her focus from the beginning on the iconography of the codices. For her, the “symbolism of them is all linked to the temple in Jerusalem.” This has been the centerpiece of her case for the antiquity of the codices. While some of the iconography on the codices may be interpreted as temple-related, this doesn’t really bear on their antiquity. Temple-related imagery is not iconographic esoterica to which the modern forger has no access. Nor is there any special imagery or arrangement of imagery that is particularly indicative of a first century CE provenance. In fact, the imagery is arbitrarily strewn around on the codices, and as I and others have shown, the vast majority of it is demonstrably modern and unquestionably links every scroll so far made public to the same workshop or craftsman (see here, here, here, or here, for instance). Some might argue that this suggests the codices date to around the same time period, and that they are consistent with the iconography of first and second century CE Syria-Palestine, but given the nonsensical and inconsistent use of the script alongside this imagery, not to mention the demonstrable contemporaneity of most of that imagery, the inescapable conclusion is just that these coins acted as inspiration or a model for the forger (see here and here, for instance). Undergirding much of Barker’s discussion was a thinly veiled derision for those of us who have been perfectly happy to judge the entire hoard of codices as forgeries. The primary concern, if her words are to be taken seriously, is that we have reached our conclusion too quickly. She states, “scholars—real scholars—work much more slowly than the popular press and the bloggers.” She continues, “it is folly to dismiss all these as fakes simply because there are bits we don’t understand. There’s bits in the Old Testament that we don’t understand.” This is a misrepresentation and a red herring. The claim is not that we cannot understand it, the claim is that the codices are demonstrably modern in origin. Sure, we assert that the script itself is nonsensical, but to twist that into “bits we don’t understand” is ludicrous. Not a word of it can be understood, and that is because it is pure nonsense. The “I will walk in uprightness” has been shown to be nothing more than wishful thinking combined with heavy squinting (here). No response has been offered to that criticism. All we’ve heard is Elkington tell me I better go back and hit the books again, since his secret army of scholars insists I and the entire field of Hebrew epigraphy are mistaken. This raises the more important concern with the asserted need for timidity and caution: what has been shown to be genuine? Absolutely nothing. Why do we need to suspend judgment when every single codex that has been made public has been shown to be linked in its provenance to the codices admitted to be base forgeries? 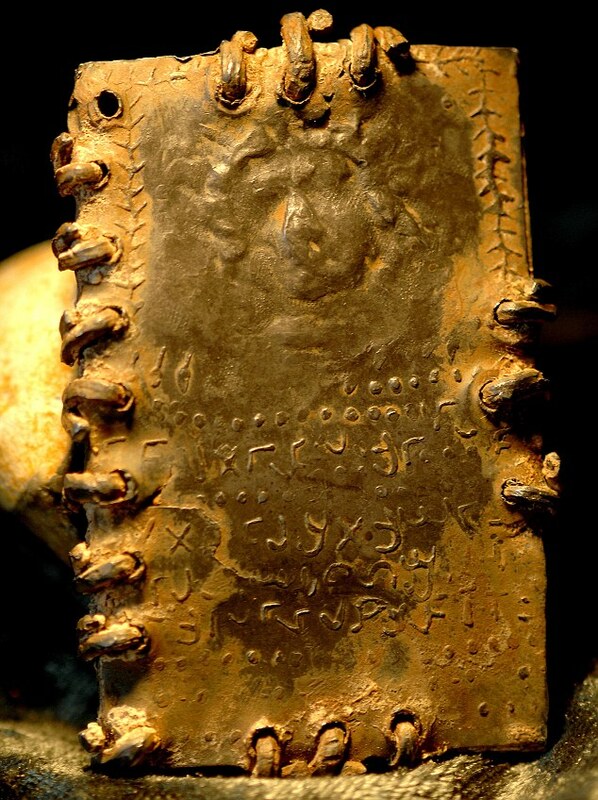 Can they share a photo of a single codex they believe to be genuine? The little early Christian ID card that Elkington showed on BBC has been shown to be a meaningless repetition of a tiny number of arbitrarily arranged letters (here and here). Even the codices tested by Northover have that same modern and fake script on them. What can they show us that demands a second look? Up until now, they have only pointed to metallurgical tests that insist the lead is old. Let us not forget that these are the metallurgical tests that Elkington himself altered in order to obscure doubts expressed therein. The cry over the last few months has been to get these codices into the public so they may be studied by anyone but the filthy bloggers. While this desire for transparency is certainly one I share, I must point out that Elkington himself has innumerable photos of these codices that could forward our research, but he is refusing to share them. No doubt they are reserved for his forthcoming publication. These blog posts have done more to disseminate info on the codices than Elkington ever has. Isn’t that what he wants? I don’t think it is. He has refused to be forthcoming from the very beginning, citing an imaginary scholarly standard that demands projects be kept secret until a foreign government gives its blessing for the players to be identified. The reluctance of that government to acknowledge Elkington has apparently crippled his ability to bring information forward. For months and months Elkington has claimed his scholars have been making significant strides in interpreting the codices. What happened to their research? When can we expect it to be made public? Did the Jordanian government magically take it, or have our criticisms made it all burst into flames? I think the answer is clear: there is no team and there are no breakthroughs. There is only the claim that has been repeated since the beginning: the lead is old, so any other criticisms are irrelevant. I for one am disappointed that Barker has thrown her lot in with Elkington and his manipulative methods. The Economist has published an article about the Jordan Codices (HT Tom Verenna). The article broadly promotes suspended judgment and urges testing, wagging a finger at those who find the evidence of their forgery to be conclusive. The response of the blogging community to the codices is collectively characterized as “denunciation and ridicule.” I cannot say that I am pleased with the article’s insight or approach. The call to suspended judgment appears to me to be more an axiom than an informed conclusion. A lot of people have said, “Oh, I’ve seen these things on the web, the, uh, language is–is–is–it’s gibberish; it–it makes no sense. It’s a very odd form of Aramaic.” Well, um, actually the news is this: it isn’t Aramaic. The script is a square script, which means it’s Hebrew, and the form of Hebrew that it is, is called paleo-Hebrew, which is very, very ancient indeed, and there are only four or five people in the world who are familiar with it. And we’re working with one of those, uh, professors at the moment, who thinks he’s on the edge of a breakthrough with the language. Following his Coast to Coast broadcast, David Elkington did not have the chance to finish addressing the final questioner due to time constraints. He would just like to clarify that the questioner was correct in one point: paleo-Hebrew was initially not a square script. In the 800 years before Christ, Hebrew was a language very much in development coming as it did from an obscure proto-language called Western Sinaitic. However, by the 1st century BC the Hasmonean form of paleo-Hebrew had indeed been made to fit in with the uniform requirements with the Hebrew of the day, thus it was reasonably square. David would like to send his best wishes to the questioner and his thanks for raising this important point. Esto es un ejemplo de un texto espanol escrito en caracteres latinos. Usualmente se utilizan algunos otros caracteres que no pertenecen a la lengua ingles, pero no es necesario para esta ilustracion. Note, the language is Spanish, but the script is Roman. Elkington consistently confuses the paleo-Hebrew script with a paleo-Hebrew language, which doesn’t exist. The paleo-Hebrew script comprises only the actual letters used to write in pretty standard Hebrew from the time period. When Elkington insists only a handful of people are familiar with the paleo-Hebrew “language,” he’s simply lying in an effort to poison the well against those who know better. If you can read the Hebrew of the turn of the era in any script—and many, many people can—learning paleo-Hebrew is as simple as memorizing script labelled “Middle” in the chart found below. It’s not difficult, and the notion that only a handful of people can understand it is simply untrue. Outsiders have approached the Team to inform them that the language on the codices is either wholly or in part Aramaic, a Syriac language still used to this day in southern and central Syria. Aramaic was the language of Jesus. (For those who would like to hear an example of spoken Aramaic, please note that Mel Gibson’s film The Passion of Christ utilized this very form.) 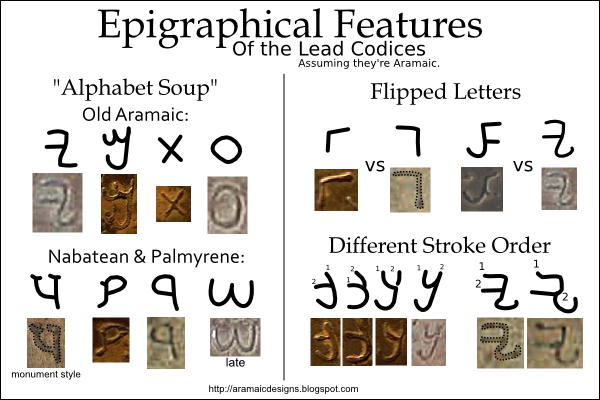 The Team has consulted various eminent experts and can inform the public that there is no Aramaic upon the lead codices as far as we can tell at this time: the language is Paleo-Hebrew. What is curious about this is that Paleo-Hebrew was defunct by the time of the 1st century. 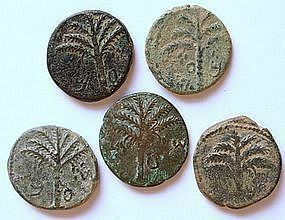 Its use therefore by the early Hebrew-Christian communities would seem to indicate a number of factors: one of them being ritualistic and the other being that Paleo-Hebrew dates back to the time of the kings (David, Solomon and so on). Therefore a conclusion could be made that in using this language in the 1st century (rather like the use of Latin for ceremonial reasons today) reference is being made to the restoration of the royal cult and its close connection to the older theology of Israel: all of this before the Deuteronomic reformations of the 7th century BC and on. As one can see from the images, the two languages appear very distinct and are indeed related; however, Paleo-Hebrew in terms of its use is much more square than Aramaic, which in its cursive form is not square. In sum, Elkington’s comments demonstrably do not come from someone at all informed in Semitic epigraphy. They come directly from Elkington himself. All his claims do. He tries to prop them up with comments from a group of scholars represented entirely and exclusively by Elkington, but he has yet to make a single statement relative to the nature or function of Aramaic or Hebrew that has not been demonstrably false. His group of scholars appears to be a figment of his imagination, concocted only to imbue his claims with an air of authority. David Elkington has posted fourteen more images of some of the codices. These he says were sent along from Hassan Saeda, and he does not comment on their authenticity. Many of the images below appear to be different shots of the same plate, whether obverse and reverse sides, or just different angles. Note that the codex I’ve designated Codex LXXIV is quite clearly genetically related to our earlier Codex XI, which was shared with Philip Davies and published in the PEQ article from last year. The same image was obviously used to produce the portrait on both codices.